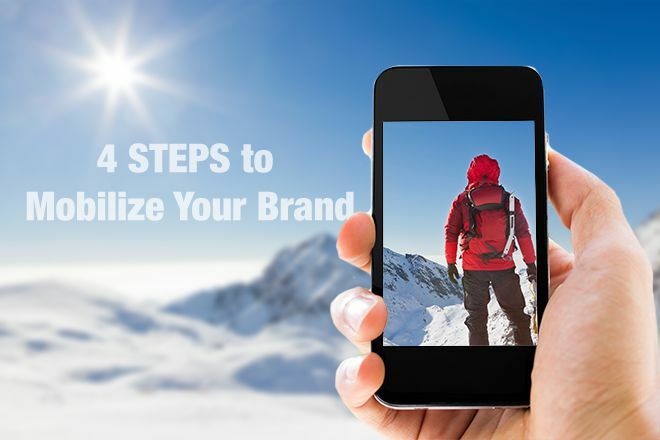 4 Steps to Mobilize Your Brand | Get the Latest Online Marketing Trends in Web Design, Social Media, Blogging, and More. There are a lot of ways to get your brand moving, but what about getting it mobilized? Small Business Trends reports that a staggering 60 percent of online traffic now comes from mobile—so what does it take to make sure your brand is mobile-ready? Instead of creating a separate mobile site and possibly running through your allotted bandwidth and taxing your server, you should endeavor to make sure that your site is responsive, with fluid columns and a theme that responds to display aesthetically on any resolution. This not only makes sure everyone has a pleasant online experience visiting your site, mobile or desktop, but also means that you only have to do half the work in updating your site. No more worrying about whether you have a photo or typeface scaled to display correctly on both an iPhone and the newest Droid: with a responsively-designed mobile site, you’re one step closer to fully mobilizing your brand. While having a responsive website goes a long way to helping your brand go mobile, it won’t do you much good if it still takes more than a second or two to load. CIO recommends making sure that all your media, from images to video, is optimized to load with lightning speed in order to reduce bounce and turn interested visitors into happy customers. This will reduce your bandwidth and offer a quicker load time for all users, not just mobile, making visits more pleasant all around. A well-designed mobile app is a tempting option. While many brand managers and digital marketing pros state that this is only really useful for big name brands like Amazon and Wal-Mart, there are plenty of industries where an app could become almost indispensable. Transportation, shipping, even service industries can all see a great uptick in sales and traffic with the introduction of a mobile app. Apps make your brand more accessible to a wider audience, and also help to improve exposure by offering traffic from online app markets like Apple’s App Store and Android’s Google Play. However, an app is a big investment that requires regular upkeep, so take the time to discuss this option with your digital marketing team before you take the plunge. The fact of the matter is, every setup is going to have a few bugs and glitches. It’s a rare thing for a complex system to work perfectly right out the gate—remember, when Disneyland first opened pretty much nothing worked—so be sure to test your site and services on multiple resolutions and devices. If you opt for a responsive site instead of a mobile version, basic testing can be done by scaling your browser window down to about 20 percent its standard width, allowing you to view the site at an extremely narrow resolution. For apps and other options, you’ll want to test it on as many devices as possible before you launch it on the App Store or Google Play. With the changes to web traffic in recent years, mobile-ready websites and brands can get up to 60 percent more traffic, 60 percent more shares and 60 percent more attention from the audience you want to reach. If you want to get your brand moving online, you need to get it mobilized!